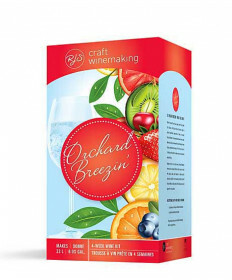 Refresh yourself, and your guests, with the subtle fruit flavors of Orchard Breezin’ wines. Light in alcohol, perfectly balanced and not too sweet, Orchard Breezin’ is the perfect beer and wine cooler alternative. Sip your favorite Orchard Breezin’ wine during cherished moments of “me” time, or serve it to family and friends to make every social occasion extraordinary. Ready to drink in only four weeks, Orchard Breezin’ wines can be enjoyed chilled on their own or mixed with juices, sodas, and liqueurs to create crowd pleasing cocktails. From strawberry to lime, Orchard Breezin’ offers a wide variety of fruit flavors that will appeal to every palate. Each kit contains superior quality grape juice and concentrate that, in as little as 4 weeks, will make 23 liters of your very own fruit-flavored craft wine.